The Time is Now to Nominate a PA Who Is Making a Difference! As previously announced, in August, the NCCPA Board voted to simplify CME requirements for PAs in the 10-year certification maintenance process by making PI-CME and self-assessment CME optional while weighting them more heavily than other types of CME. Implementing those changes requires changes to our back-end systems, web site and mobile app. That work is well underway and will be completed in December. When that work is complete, we will update the certification maintenance cycle – extending certification expiration for the next two years through December 31, 2018 – for all PAs who have completed the requirements. Knowing some are asked for documentation of certification maintenance completion even before their year-end expiration, we are reviewing records and within the next week will send most PAs who have satisfied certification maintenance requirements an “early completion” email to document they have fulfilled all requirements. We will repeat this process in mid-November and at the beginning of December. Once issued, that email correspondence can also be viewed in the “Correspondence” tab of the “My Account” section of your online record. Because the programming that will weight the PI-CME and self-assessment CME is still in progress, PAs who need the weighting to reach the required number of CME credits will not receive one of these early completion letters. The weighting will be applied retroactively, and records for all PAs who have completed requirements will be updated before the end of the year. In the meantime, PAs in the 10-year process who have not met those now-canceled PI-CME and self-assessment requirements will continue to receive certification maintenance reminders for the next couple of months. We apologize for the inconvenience this causes and ask for your patience as we work to make these important changes to our systems. Through the end of 2017, NCCPA will accept applications from currently and formerly certified PAs meeting the requirements above. Beginning in 2018, applications will only be accepted from currently certified PAs, to be awarded when their PA-C certification expires. When PAs who obtain this new designation engage in volunteer service, it is important to note the PA-C Emeritus is not considered certification and may not be used in the context of any clinically-related interaction, including volunteer service. Proceeds from the one-time $50 application fee will benefit the PA Foundation to expand the NCCPA Endowed Scholarship awarded to PA students. The PA-C Emeritus designation will be maintained on two-year calendar year cycles and will include an attestation that the PA continues to meet the requirements for initial eligibility. There is no renewal fee. 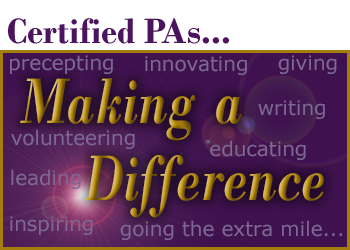 Do you know someone who embodies the best of what it is to be a Certified PA? We want to hear about it! In celebration of the 50th anniversary of the PA profession, NCCPA and the nccPA Health Foundation want to recognize “50 PAs who are making a difference today”. We will profile 50 of those PAs online during 50 weeks of celebration in 2017, recognizing them as examples of the many ways Certified PAs are demonstrating that when it comes to high quality health care, promoting wellness, saving and changing lives… #PAsDoThat! It's quick and easy to nominate someone you know. Just click https://www.surveymonkey.com/r/50PAs and answer a few short questions. Nominations are due by Dec 31, 2016. The Statistical Report on Recently Certified PAs confirmed: PAs are still in high demand! Over 77% of the 7,776 PAs who passed PANCE in 2015 shared their experiences through NCCPA’s PA Profile. More than 75% reported receiving two or more job offers. Half accepted a position in a hospital setting. Want to learn more about recently certified PAs? Click here. 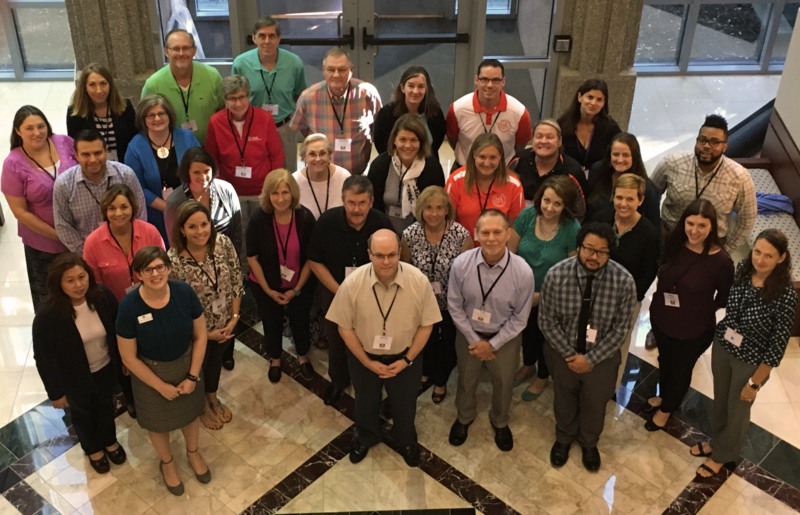 Year-after-year we receive positive feedback from attendees of the PA Educators Workshop – and this year was no exception. Thirty-five attendees benefitted from presentations by NCCPA leaders and staff members plus leaders from the PA History Society, nccPA Health Foundation, PAEA and ARC-PA.
“The PA educators workshop provided me with useful tools and tips that I was able to share with our program and put to use immediately. (It is) definitely a 'must' for program leaders and faculty who desire to learn more about our partnering agencies and their roles in protecting and promoting the profession,” says attendee Patricia Campbell, PA-C, RDN, MPAS, MPH, clinical coordinator at UW-Lacrosse. Looking to integrate oral health in your practice but don’t know where to get started? Apply for an nccPA Health Foundation oral health integration grant for up to $3,000 in funding to support your efforts and use the new Oral Health Integration Implementation Guide. Qualis Health, one of the nation’s leading population healthcare management organizations, published a comprehensive set of tools to help integrate oral health as part of whole-person care and improve patient outcomes and experience. The new guide builds on the oral health delivery framework published in 2015 and provides insight for implementing screening for oral health risk factors and active disease, initiating appropriate preventive interventions, and coordinating dental care for those with active disease. Tooth decay is a transmissible, chronic, infectious disease that impacts overall health and quality of life. Oral disease also exacerbates chronic conditions and is a source of significant health disparities, especially among vulnerable and underserved populations. Listen to your PA colleagues and others share their experiences about the importance of oral health as part of equitable care by watching this video. The implementation guide includes more than 20 tools and seven case examples developed in partnership with 19 field testing sites over the last 20 months. The guide’s development was sponsored by the National Interprofessional Initiative in Oral Health (NIIOH) and its funders. 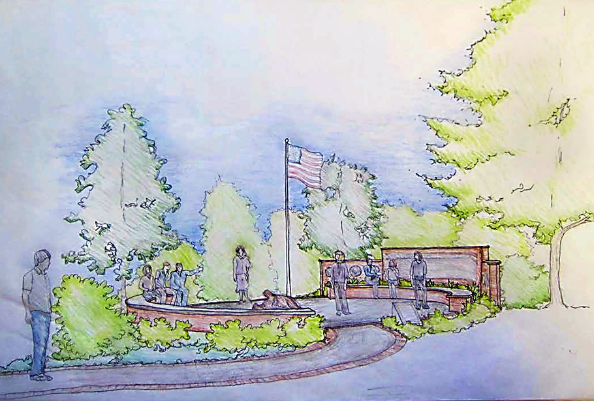 The PAHx continues to raise funds for the Veterans Memorial Garden, a site that honors the contributions made by former and current military PAs to the PA profession. In addition to accepting general monetary donations, the Society has also established a “buy an engraved paver” program with the Bricks R Us Company. The tax deductible 9x9 inch brick pavers, which honor PA veterans and PAs on active duty in the Uniformed Services, can be purchased online here. The engraved paver will include the appropriate uniformed service logo and 3 lines for name, branch and years of service. The engraved brick pavers will be embedded in the wheelchair accessible walkway and the patio surrounding the centerpiece of the garden, the life-size bronze combat medic statue and flagpole. The pavers are a great way for PAs to honor their PA veteran colleagues, especially those who are no longer with us. Please consider making a donation in honor of the veterans who are honored by this garden. For more information about this project, please visit our website, or write to us at contactus@pahx.org. Congratulations to Dawn LaBarbera, PA-C from Fort Wayne, IN, winner of the iPad Mini drawing held at the PAHx booth during the recent PAEA Education Forum in Minneapolis! Thanks to everyone who participated in the drawing and visited the PAHx booth. Check out the fall edition of Historical Happenings, the Society’s quarterly newsletter, for the latest news in PA history! Be sure to "like" PA History Society on Facebook to receive updates and follow us on Twitter and LinkedIn. NCCPA issued a press release highlighting the great demand for recently certified PAs showing that over ¾ of them had multiple job offers.The data is from the just-released 2015 Statistical Report of Recently Certified Physician Assistants. The report is on the NCCPA website and you can read it here.